After reading two books on the predicted future of the United States after oil depletion (The Long Emergency & Beyond Fossil Fools) we decided to do 3 things to help improve our finances for the future; Solar PV, Solar Water Heater, and to bury our grass lawn and replace it with rock. Of course a major consideration for us cost as we did not have enough money to put a full solar PV system on our house. We could have put a 3kW system and kept the grass yard and electric water heater but figured we can always add onto the PV system later. So in December 2009 we buried the grass yard and spread rock. In January 2010 our solar water heater was installed. In March 2010 our solar Photovoltaic system was commissioned. We also installed full time electric meters on all of our 220 volt circuits. Our thinking was to find out where all of our electricity was being used and where future cost saving projects may come from. Our first year data is below. 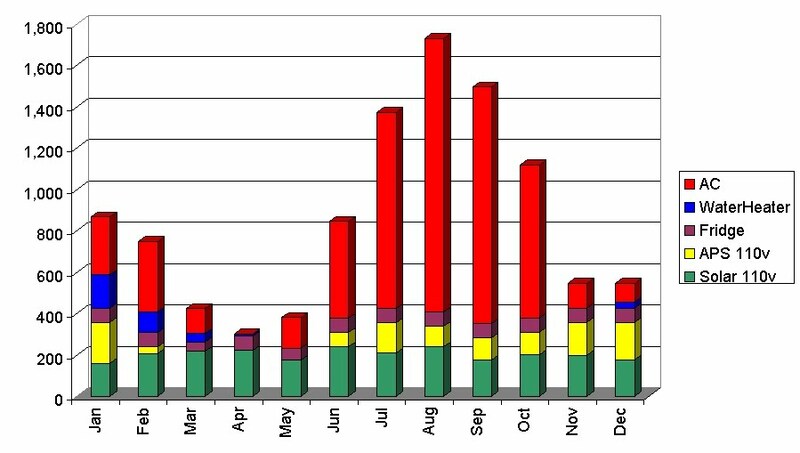 The Bar graph to the left shows a month by month usage (or solar generation) for the first full year having our solar panels. 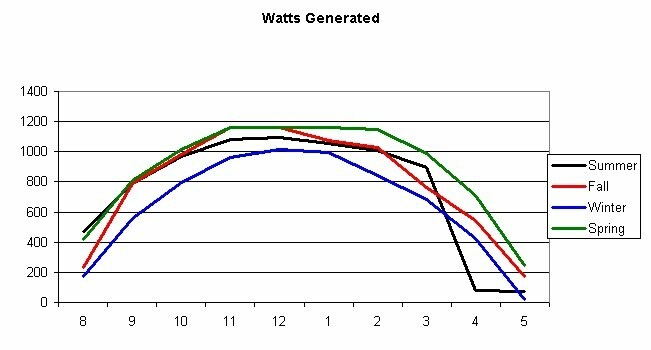 The solar generated by our 1.1kW system basically only covers part of our household 110v circuits. So to properly interpruit this graph you should add the light blue solar to the yellow house 110v for usage. Our solar water heater has an electric backup so in the winter (cold cloudy days) we use a small amount of electricity to heat our water. The pie chart on the right shows our household electricity usage as a percentage of total usage. 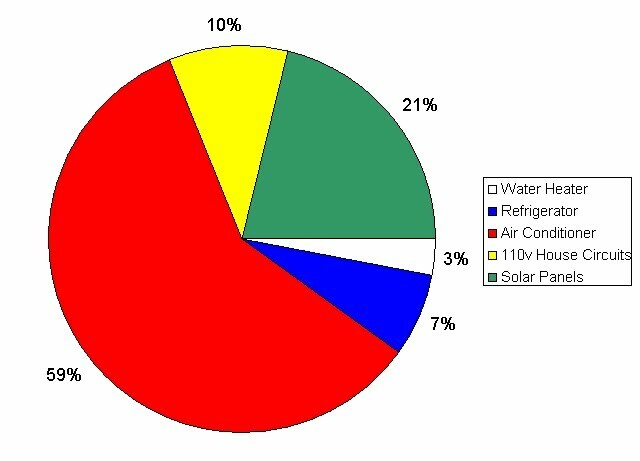 As you can see our air conditioner/heater is our biggest consumer of electricity using 59% of all of our annual electricity. Thirty-one percent of our electrical usage was for our 110 volt circuits of which 21 percent was generated by our 1.1kW solar PV system. We only had the refrigerator hooked up to a watt meter for 45 days of the year and the electrical usage for the refrigerator was annualized off of that 45 day data and came in at 7% of our total utility usage. Our solar water heater has an electric backup so in the winter on cold cloudy days the electric backup kicks in and accounted for 3% of our usage. This chart shows our annual electricity usage. In 2007 - 2009 we had Pam's mother living with us so you can see a higher usage for those years. December of 2009 we shut off the sprinklers to our front and back yard grass, put down black plastic to cover the grass, and buried it with rock. 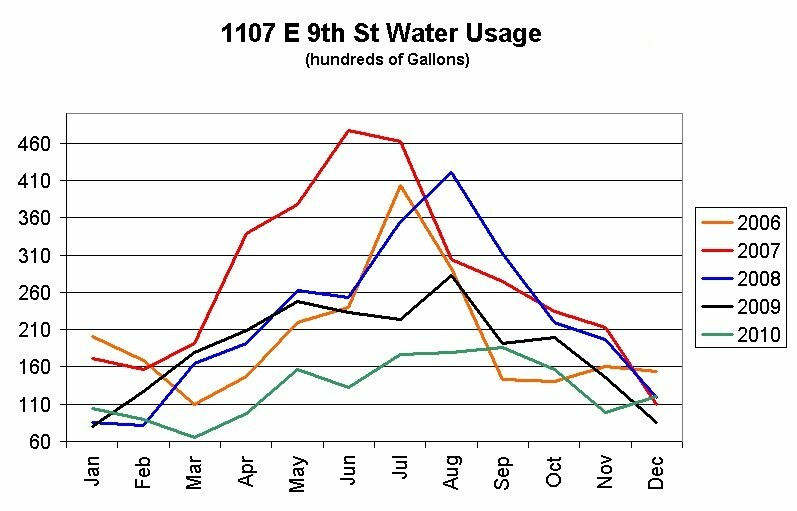 Ironically, (not to our knowledge at that time) the Arizona Water company had raised the water rates two months before. By not watering a grass lawn our total water usage was reduced by 42% for 2010. But the cost savings are skewed due to the fact that water rates were raised about that same time. Even though we would have saved (probably) 42% on the bill the actual cost savings only shows at 22% over the previous 4 year average but if the cost increase is taken into consideration we actually saved over 58% since the water company raised their rates 33.83%. It's all about the timing! Water savings 2.8 gallons per shower. I also hooked up a watt meter for a month and found out it cost me about $8.25 a year to run the ChilliPepper. Bottom line, it does not save me any money - only water. I also put a remote thermometer up in my attic to see if I needed any additional attic insulation. 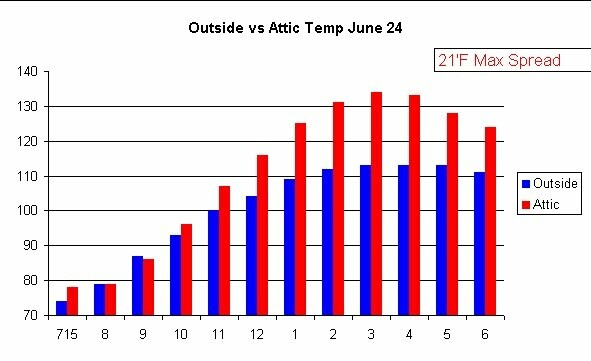 I recorded the temperatures on June 24th when the predicted highs we going to be 112 degrees F thinking that was 4 degrees above our average temperature and with crystal clear skies that day we would have the most radiant energy penetrating the roofing. The graph to the right represents hourly readings from my 1.1kW solar PV system at the first of each season. (June 24, September 19, December 22, & March 21) It shows that Spring and Fall are the best solar producers for my system. In fact Winter production was 36% below the Spring reading. The summer readings were skewed due to a large tree that would shade the solar panels starting around 3:45. After seeing the impact the tree was cut down and no longer effects the solar panels. It should be noted that the solar panels are at a 25% tilt angle with optimum for our area should be 32%. The angle is such to match the existing roof angle. That makes it optimized for Summer production but with the higher heat in the summer the Spring and Fall actually produce more. In November 2012 I installed an additional 4.3kW system using the Enphase inverters. Now our house is 95+% solar and we use the grid only as our battery. The two solar systems combined produce 5.4kW's plus my solar water heater. I can tell you when every cloud passes over our house!! !